It’s probably safe to assume that in Georgian days, when the Noel-Hills, their eight children and staff of servants occupied the Hall, and the front fields were still “parkland”, the walled garden(s) would have been a busy and productive source of vegetables, fruit, herbs and flowers for the household. A modest gang of gardeners and boys would have tended neat plots, greenhouses, orchards and beds to keep everyone supplied. It would be interesting to know how that changed in the following 100 years as the vicarage household adjusted to absences, temporary lets and eventual reduction to an elderly vicar, housekeeper and cook. In the later 1970’s, the 80’s and early 90’s – the decades of Crabapple Commune – much of the 20 acres of land was farmed and market-gardened to supply not just the household, but the Crabapple Wholefoods shop in town too. The walled garden, for a time, was half down to chickens (a flock of over 100) and half to a single vegetable or grain crop. Growing was, at that time, a commercial operation, providing both food and a living for all at the Hall. When all that became too much, and the shop was let, and income gleaned in other ways, growing reverted to domestic food production. 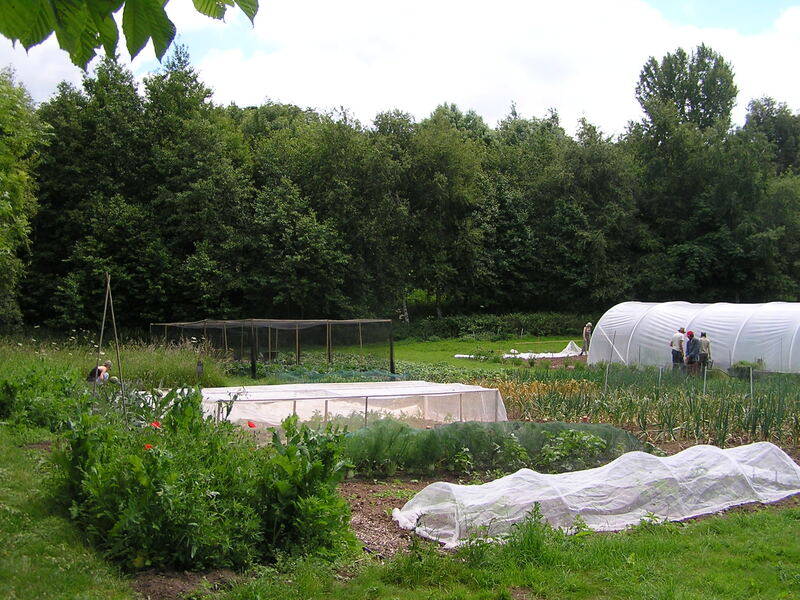 And in the mid 1990’s – very much of it’s time – the permaculture revolution. Out went the traditional annual vegetable beds, out went the separate dedicated fruit plots and cages – the garden was redesigned in a circular pattern with quadrant sections, edged with fruit and containing a mix of low-maintenance perennial and annual vegetables. Unfortunately, an ongoing maintenance plan was not a successful part of the design and food production in the garden, despite some valiant efforts, became patchy, difficult and disheartening. Now we are having another go. Organic principles underpin. Many permaculture principles inform forward thinking. Above all we are feeding the household – aiming to be self-reliant in seasonal, local vegetables, fruit, herbs and flowers. Sound familiar? Two seasons in, things are looking up. We are finding out what ”self-reliant” means and moving towards it. We are learning (relearning, no doubt) what grows well here, what pests and diseases like it here – and we are exploring new practices with the future effects of climate change in mind – and a healthy curiosity for new, different and unexpected experiences. Check out the salads! We don’t have – won’t have – livestock. A big challenge will be to maintain fertility. Ideally we want to do that veganically and without imports. Composting and green manures will be key – and a learning curve. As gardening is. Find out more about our different growing spaces.